Gameloft’s arcade racing game Asphalt 9 Legends has just got its first update. The new update to the Asphalt 9 Legends has added two new cars, daily goals feature, club race mode, and tap-to-steer customizable feature. Additionally, when you rank up in the multiplayer mode, you will receive better rewards. Among all these, club race mode is the main highlighted feature. It allows you to play Asphalt 9 Legends with friends; you can challenge you club friends! Let’s learn how to create and join a club race! First of all, you and your friend must be in the same club. You can create a club by spending 50 tokens and invite friends anytime. On the main screen of the game(home screen), at the bottom menu, tap the My Club option or enter the club milestones screen. On that screen, at the bottom, tap the club race button. After it, at the top-right side, tap the create button to create the private race. Tapping the create button will send you to the race customization screen where you can select the location or track and select the number of laps; 1, 2, 3. Once done, hit the create button. Choose a car -> tap the create button again. The Asphalt 9 Legends game’s this feature allows you to invite up to eight friends. If your friend has created a race and you want to join, then tap the side menu button(club chat) -> there should be the invite message -> tap the join button to join the club race. Once you are set, hit the launch button(race creator can perform this action). Well, this is the first big update to the game after global release. It has made the reward system quite good, added the club race mode, and brand new cars; Lotus Elise Sprint 220 and Ferrari J50. You can read the Asphalt 9 Legends tips, cheats & tricks here and learn everything about the game. 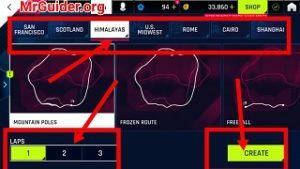 So this is a short guide on Asphalt 9 Legends: How to play Asphalt 9 with Friends.